Radiative forcing is a “useful” concept in climate science. But while it informs it also obscures and many people are confused about its applicability. Also many people are confused about why stratospheric adjustment takes place and what that means. And why does the definition of the tropopause, which is a concept that doesn’t have one definite meaning, affect this all important concept of radiative forcing. Surely there is a definition which is clear and unambiguous? So there are a few things we will attempt to understand in this article. The value of radiative forcing (however it is derived) has the same usefulness as the rate of inflation, or the exchange rate as measured by a basket of currencies (with relevant apologies to all economists reading this article). The rate of inflation tells you something about how prices are increasing but in the end it is a complex set of relationships reduced to a single KPI. It’s quite possible for the rate of inflation to be the same value in two different years, and yet one important group of the country in question to see no increase in their spending in the first year yet a significant increase in their spending costs in the second year. That’s the problem with reducing a complex problem to one number. However, the rate of inflation apparently has some value despite being a single KPI. And so it is with radiative forcing. The good news is, when we get the results from a GCM, we can be sure the value of radiative forcing wasn’t actually used. Radiative forcing is more to inform the public and penniless climate scientists who don’t have access to a GCM. The more precision you put into a GCM the slower it runs. So comparing 100’s of different cases can be impossible. Such is the dilemma of a climate scientist with access to a supercomputer running a GCM but a long queue of funded but finger-tapping climate scientists behind him or her. Wonderland is a compromise model and is described in Wonderland Climate Model by Hansen et al (1997). This model includes some basic geography that is similar to the earth as we know it. It is used to provide insight into radiative forcing basics. A climate model provides a tool which allows us to think about, analyze, and experiment with a facsimile of the climate system in ways which we could not or would not want to experiment with the real world. As such, climate modeling is complementary to basic theory, laboratory experiments and global observations. Each of these tools has severe limitations, but together, especially in iterative combinations they allow our understanding to advance. Climate models, even though very imperfect, are capable of containing much of the complexity of the real world and the fundamental principles from which that complexity arises. Thus models can help structure the discussions and define needed observations, experiments and theoretical work. For this purpose it is desirable that the stable of modeling tools include global climate models which are fast enough to allow the user to play games, to make mistakes and rerun the experiments, to run experiments covering hundreds or thousands of simulated years, and to make the many model runs needed to explore results over the full range of key parameters. Thus there is great incentive for development of a highly efficient global climate model, i.e., a model which numerically solves the fundamental equations for atmospheric structure and motion. We examine the sensitivity of a climate model to a wide range of radiative forcings, including change of solar irradiance, atmospheric CO2, O3, CFCs, clouds, aerosols, surface albedo, and “ghost” forcing introduced at arbitrary heights, latitudes, longitudes, season, and times of day. We show that, in general, the climate response, specifically the global mean temperature change, is sensitive to the altitude, latitude, and nature of the forcing; that is, the response to a given forcing can vary by 50% or more depending on the characteristics of the forcing other than its magnitude measured in watts per square meter. In other words, radiative forcing has its limitations. The authors explain a few different approaches to the definition of radiative forcing. If we can understand the difference between these definitions we will have a much clearer view of atmospheric physics. From here, the quotes and figures will be from Radiative Forcing and Climate Response, Hansen, Sato & Ruedy (1997) unless otherwise stated. Readers who have seen the IPCC 2001 (TAR) definition of radiative forcing may understand the intent behind this 1997 paper. Up until that time different researchers used inconsistent definitions. The simplest useful definition of radiative forcing is the instantaneous flux change at the tropopause. This is easy to compute because it does not require iterations. This forcing is called “mode A” by WMO . We refer to this forcing as the “instantaneous forcing”, Fi, using the nomenclature of Hansen et al [1993c]. In a less meaningful alternative, Fi is computed at the top of the atmosphere; we include calculations of this alternative for 2xCO2 and +2% S0 for the sake of comparison. An improved measure of radiative forcing is obtained by allowing the stratospheric temperature to adjust to the presence of the perturber, to a radiative equilibrium profile, with the tropospheric temperature held fixed. This forcing is called “mode B” by WMO ; we refer to it here as the “adjusted forcing”, Fa [Hansen et al 1993c]. The rationale for using the adjusted forcing is that the relaxation time of the stratosphere is only several months [Manabe & Strickler, 1964], compared to several decades for the troposphere [Hansen et al 1985], and thus the adjusted forcing should be a better measure of the expected climate response for forcings which are present at least several months..The adjusted forcing can be calculated at the top of the atmosphere because the net radiative flux is constant throughout the stratosphere in radiative equilibrium. The calculated Fa depends on where the tropopause level is specified. We specify this level as 100 mbar from the equator to 40° latitude, changing to 189 mbar there, and then increasing linearly to 300 mbar at the poles. This explanation might seem confusing or abstract so I will try and explain. Let’s say we have a sudden increase in a particular GHG (see note 1). We can calculate the change in radiative transfer through the atmosphere with a given temperature profile and concentration profile of absorbers with little uncertainty. This means we can see immediately the reduction in outgoing longwave radiation (OLR). And the change in absorption of solar radiation. Now the question becomes – what happens in the next 1 day, 1 month, 1 year, 10 years, 100 years? Small changes in net radiation (solar absorbed – OLR) will have an equilibrium effect over many decades at the surface because of the thermal inertia of the oceans (the heat capacity is very high). The issue that everyone found when they reviewed this problem – the radiative forcing on day 1 was different from the radiative forcing on day 90. Because the changes in net absorption above the tropopause (the place where convection stops and let’s review that definition a little later) affect the temperature of the stratosphere very quickly. So the stratosphere quickly adjusts to the new world order and of course this changes the radiative forcing. It’s like (in non-technical terms) the stratosphere responded very quickly and “bounced out” some of the radiative forcing in the first month or two. So the stratosphere, with little heat capacity, quickly adapts to the radiative changes and moves back into radiative equilibrium. This changes the “radiative forcing” and so if we want to work out the changes over the next 10-100 years there is little point in considering the radiative forcing on day 1, but maybe if the quick responders sort themselves out in 60 days we can wait for the quick responders to settle down and pick the radiative forcing number after 90-120 days. This is the idea behind the definition. This red line is the value of flux change after the stratosphere has adjusted to the radiative forcing. Why is the red line vertical? The stratosphere is now in temperature equilibrium because energy in = energy out at all heights. With no convection in the stratosphere this is the same as radiation absorbed = radiation emitted at all heights. Therefore, the net flux change with height must be zero. If we plotted separately the up and down flux we would find that they have a slope, but the slope of the up and down would be the same. 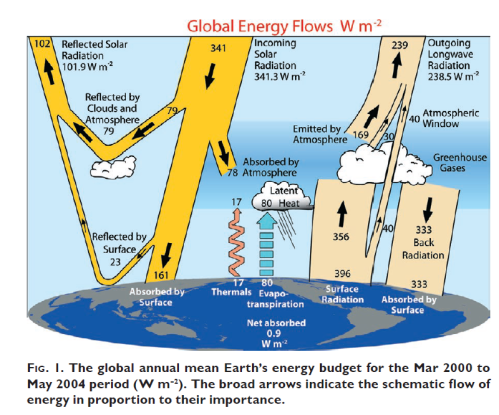 Net absorption of radiation going up balances net emission of radiation going down – more on this in Visualizing Atmospheric Radiation – Part Eleven – Stratospheric Cooling. Another important point, we can see in the top left graph that the instantaneous net flux at the tropopause (i.e., the net flux on day one) is different from the net flux at the tropopause after adjustment (i.e., after the stratosphere has come into radiative balance). But once the stratosphere has come into balance we could use the TOA net flux, or the tropopause net flux – it would not matter because both are the same. On the left, case a, instantaneous forcing. This is the result of the change in net radiation absorbed vs height on day one. Temperature doesn’t change instantaneously so it’s nice and simple. On the next graph, case b, adjusted forcing. This is the temperature change resulting from net radiation absorbed after the stratosphere has come into equilibrium with the new world order, but the troposphere is held fixed. So by definition the tropospheric temperature is identical in case b to case a. On the next graph, case c, no feedback response of temperature. Now we allow the tropospheric temperature to change until such time as the net flux at the tropopause has gone back to zero. But during this adjustment we have held water vapor, clouds and the lapse rate in the troposphere at the same values as before the radiative forcing. On the last graph, case d, all feedback response of temperature. Now we let the GCM take over and calculate how water vapor, clouds and the lapse rate respond. And as with case c, we wait until the temperature has increased sufficiently that net tropopause flux has gone back to zero. What Definition for the Tropopause and Why does it Matter? We’ve seen that if we use adjusted forcing that the radiative forcing is the same at TOA and at the tropopause. And the adjusted forcing is the IPCC 2001 definition. So why use the forcing at the tropopause? And why does the definition of the tropopause matter? The first question is easy. We could use the forcing at TOA, it wouldn’t matter so long as we have allowed the stratosphere to come into radiative equilibrium (which takes a few months). As far as I can tell, my opinion, it’s more about the history of how we arrived at this point. If you want to run a climate model to calculate the radiative forcing without stratospheric equilibrium then, on day one, the radiative forcing at the tropopause is usually pretty close to the value calculated after stratospheric equilibrium is reached. And lastly, why then does the definition of the tropopause matter? The reason is simple, but not obvious. We are holding the tropospheric temperature constant, and letting the stratospheric temperature vary. The tropopause is the dividing line. So if we move the dividing line up or down we change the point where the temperatures adjust and so, of course, this affects the “adjusted forcing”. This is explained in some detail in Forster et al (1997) in section 4, p.556 (see reference below). Understanding what radiative forcing means requires understanding a few basics. The value of radiative forcing depends upon the somewhat arbitrary definition of the location of the tropopause. Some papers like Freckleton et al (1998) have dived into this subject, to show the dependence of the radiative forcing for doubling CO2 on this definition. 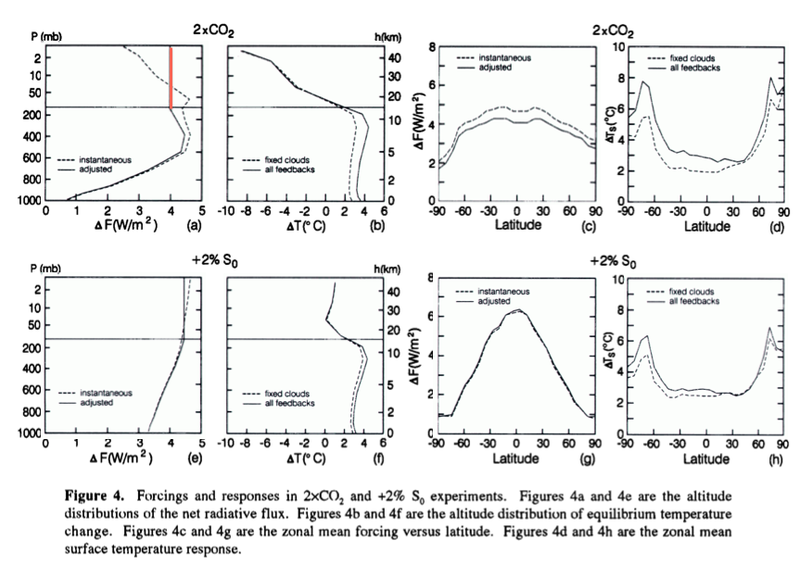 We haven’t covered it in this article, but the Hansen et al (1997) paper showed that radiative forcing is not a perfect guide to how climate responds (even in the idealized world of GCMs). That is, the same radiative forcing applied via different mechanisms can lead to different temperature responses. Is it a useful parameter? Is the rate of inflation a useful parameter in economics? Usefulness is more a matter of opinion. What is more important at the start is to understand how the parameter is calculated and what it can tell us. Note 1: The idea of an instantaneous increase in a GHG is a thought experiment to make it easier to understand the change in atmospheric radiation. If instead we consider the idea of a 1% change per year, then we have a more difficult problem. 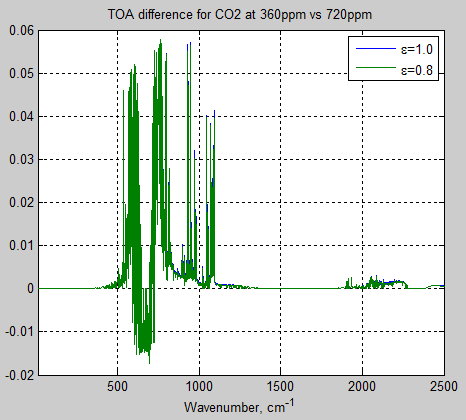 (Of course, GCMs can quite happily work with a real-world slow change in GHGs. And they can quite happily work with a sudden change). The earth’s surface is not a black-body. A blackbody has an emissivity and absorptivity = 1.0, which means that it absorbs all incident radiation and emits according to the Planck law. The oceans, covering over 70% of the earth’s surface, have an emissivity of about 0.96. Other areas have varying emissivity, going down to about 0.7 for deserts. (See note 1). A lot of climate analyses assume the surface has an emissivity of 1.0. Let’s try and qualify the effect of this assumption. The most important point to understand is that if the emissivity of the surface, ε, is less than 1.0 it means that the surface also reflects some atmospheric radiation. Let’s first do a simple calculation with nice round numbers. Say the surface is at a temperature, Ts=289.8 K. And the atmosphere emits downward flux = 350 (W/m²). If ε = 1.0 the surface emits 400. And it reflects 0. So a total upward radiation of 400. If ε = 0.8 the surface emits 320. And it reflects 70 (350 x 0.2). So a total upward radiation of 390. So even though we are comparing a case where the surface reduces its emission by 20%, the upward radiation from the surface is only reduced by 2.5%. Now the world of atmospheric radiation is very non-linear as we have seen in previous articles in this series. The atmosphere absorbs very strongly in some wavelength regions and is almost transparent in other regions. So I was intrigued to find out what the real change would be for different atmospheres as surface emissivity is changed. To do this I used the Matlab model already created and explained – in brief in Part Two and with the code in Part Five – The Code (note 2). The change in surface emissivity is assumed to be wavelength independent (so if ε = 0.8, it is the case across all wavelengths). I used some standard AFGL (air force geophysics lab) atmospheres. A description of some of them can be seen in Part Twelve – Heating Rates (note 3). We can see that the difference occurs in the 800-1200 cm-1 region (8-12 μm), the so-called “atmospheric window” – see Kiehl & Trenberth and the Atmospheric Window. We will come back to the reasons why in a moment. We can see that the same region is responsible and the difference is much greater. We can see that the surface emissivity of the tropics has a negligible difference on OLR. The higher latitude winters have a 5% change for the same surface emissivity change, and the higher latitude summers have around 2-3%. For the tropics, the hot humid atmosphere radiates quite close to a blackbody, even in the “window region” due to the water vapor continuum. We can see this explained in detail in Part Ten – “Back Radiation”. So any “missing” radiation from a non-blackbody surface is made up by reflection of atmospheric radiation (where the radiating atmosphere is almost at the same temperature as the surface). When we move to higher latitudes the “window region” becomes more transparent, and so the “missing” radiation cannot be made up by reflection of atmospheric radiation in this wavelength region. This is because the atmosphere is not emitting in this “window” region. And the effect is more pronounced in the winters in high latitudes because the atmosphere is colder and so there is even less water vapor. So it’s clear that in this specific case of calculating the difference in CO2 from 360ppm to 720ppm it doesn’t matter whether we use surface emissivity = 1.0 or 0.8. The earth’s surface is not a blackbody. No one in climate science thinks it is. But for a lot of basic calculations assuming it is a blackbody doesn’t have a big impact on the TOA radiation – for the reasons outlined above. And it has even less impact on the calculations of changes in CO2. The tropics, from 30°S to 30°N, are about half the surface area of the earth. And with a typical tropical atmosphere, a drop in surface emissivity from 1.0 to 0.8 causes a TOA OLR change of less than 1%. Of course, it could get more complicated than the calculations we have seen in this article. Over deserts in the tropics, where the surface emissivity actually gets below 0.8, water vapor is also low and therefore the resulting TOA flux change will be higher (as a result of using actual surface emissivity vs black body emissivity). I haven’t delved into the minutiae of GCMs to find out what they assume about surface emissivity and, if they do use 1.0, what calculations have been done to quantify the impact. The average surface emissivity of the earth is much higher than 0.8. I just picked that value as a reference. The results shown in this article should help to clarify that the effect of surface emissivity less than 1.0 is not as large as might be expected. Note 1: Emissivity and absorptivity are wavelength dependent phenomena. 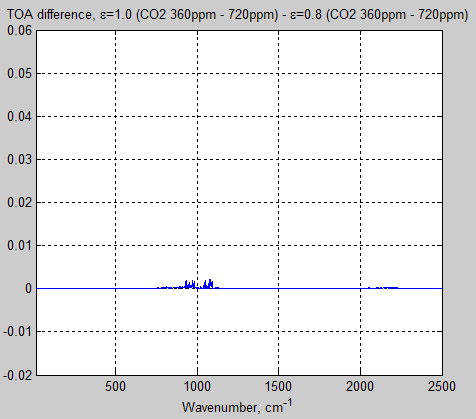 So these values are relevant for the terrestrial wavelengths of 4-50μm. Note 2: There was a minor change to the published code to allow for atmospheric radiation being reflected by the non-black surface. This hasn’t been updated to the relevant article because it’s quite minor. Anyone interested in the details, just ask. In this model, the top of atmosphere is at 10 hPa. Some outstanding issues remain in my version of the model, like whether the diffusivity improvement is correct or needs improvement, and the Voigt profile (important in the mid-upper stratosphere) is still not used. These issues will have little or no effect on the question addressed in this article. Note 3: For speed, I only considered water vapor and CO2 as “greenhouse” gases. No ozone was used. To check, I reran the tropical atmosphere with ozone at the values prescribed in that AFGL atmosphere. The difference between ε = 1.0 and ε = 0.8 was 0.7% – less than with no ozone (0.8%). This is because ozone reduces the transparency of the “atmospheric window” region. The upper troposphere is very dry, and so the mass of water vapor we need to change OLR by a given W/m² is small by comparison with the mass of water vapor we need to effect the same change in or near the boundary layer (i.e., near to the earth’s surface). See also Visualizing Atmospheric Radiation – Part Four – Water Vapor. This means that when we are interested in climate feedback and how water vapor concentration changes with surface temperature changes, we are primarily interested in the changes in upper tropospheric water vapor (UTWV). A major problem with analyzing UTWV is that most historic measurements are poor for this region. The upper troposphere is very cold and very dry – two issues that cause significant problems for radiosondes. The atmospheric infrared sounder (AIRS) was launched in 2002 on the Aqua satellite and this instrument is able to measure temperature and water vapor with vertical resolution similar to that obtained from radiosondes. At the same time, because it is on a satellite we get the global coverage that is not available with radiosondes and the ability to measure the very cold, very dry upper tropospheric atmosphere. This study will build upon previous estimates of the water vapor feedback, by focusing on the observed response of upper-tropospheric temperature and humidity (specific and relative humidity) to changes in surface temperatures, particularly ocean temperatures. Similar efforts have been performed before (see below), but this study will use new high vertical resolution satellite measurements and compare them to an atmospheric general circulation model (GCM) at similar resolution. The water vapor feedback arises largely from the tropics where there is a nearly moist adiabatic profile. If the profile stays moist adiabatic in response to surface temperature changes, and if the relative humidity (RH) is unchanged because of the supply of moisture from the oceans and deep convection to the upper troposphere, then the upper-tropospheric specific humidity will increase. The goal of this work is a better understanding of specific feedback processes using better statistics and vertical resolution than has been possible before. We will compare satellite data over a short (4.5 yr) time record to a climate model at similar space and time resolution and examine the robustness of results with several model simulations. The hypothesis we seek to test is whether water vapor in the model responds to changes in surface temperatures in a manner similar to the observations. This can be viewed as a necessary but not sufficient condition for the model to reproduce the upper-tropospheric water vapor feedback caused by external forcings such as anthropogenic greenhouse gas emissions. The graphs show that change in 250 mbar RH with temperature is statistically indistinguishable from zero. For those not familiar with the basics, if RH stays constant with rising temperature it is the same as increasing “specific humidity” – which means an increased mixing ratio of water vapor in the atmosphere. And we see this is the right hand graph. Figure 1a has considerable scatter, but in general, there is little significant change of 250-hPa relative humidity anomalies with anomalies in the previous month’s surface temperature. The slope is not significantly different than zero in either AIRS observations (1.9 ± 1.9% RH/°C) or CAM (1.4 ± 2.8% RH/°C). The situation for specific humidity in Fig. 1b indicates less scatter, and is a more fundamental measurement from AIRS (which retrieves specific humidity and temperature separately). In Fig. 1b, it is clear that 250- hPa specific humidity increases with increasing averaged surface temperature in both AIRS observations and CAM simulations. At 250 hPa this slope is 20 ± 8 ppmv/°C for AIRS and 26 ± 11 ppmv/°C for CAM. This is nearly 20% of background specific humidity per degree Celsius at 250 hPa. The observations and simulations indicate that specific humidity increases with surface temperatures (Fig. 1b). The increase is nearly identical to that required to maintain constant relative humidity (the sloping dashed line in Fig. 1b) for changes in upper-tropospheric temperature. There is some uncertainty in this constant RH line, since it depends on calculations of saturation vapor mixing ratio that are nonlinear, and the temperature used is a layer (200–250 hPa) average. The graphs below show the change in each variable as surface temperature is altered as a function of pressure (height). The black line is the measurement (AIRS). There are a number of model runs using CAM with different constraints. This is a common theme in climate science – researchers attempting to find out what part of the physics (at least as far as the climate model can reproduce it) contributes the most or least to a given effect. The paper has no paywall, so readers are recommended to review the whole paper. The question of how water vapor responds to increasing surface temperature is a critical one in climate research. 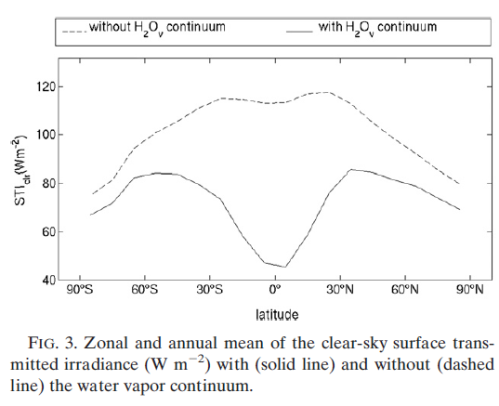 The fundamentals are discussed in earlier articles, especially Clouds and Water Vapor – Part Two – and much better explained in the freely available paper Water Vapor Feedback and Global Warming, Held and Soden (2000). 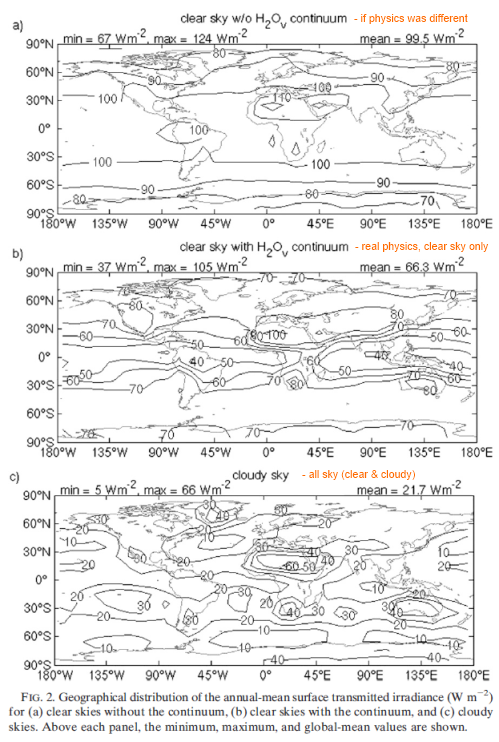 One of the key points is that the response of water vapor in the planetary boundary layer (the bottom layer of the atmosphere) is a lot easier to understand than the response in the “free troposphere”. But how water vapor changes in the free troposphere is the important question. And the water vapor concentration in the free troposphere is dependent on the global circulation, making it dependent on the massive complexity of atmospheric dynamics. Gettelman and Fu attempt to answer this question for the first half decade’s worth of quality satellite observation and they find a result that is similar to that produced by GCMs. Many people outside of climate science believe that GCMs have “positive feedback” or “constant relative humidity” programmed in. Delving into a climate model is a technical task, but the details are freely available – e.g., Description of the NCAR Community Atmosphere Model (CAM 3.0), W.D. Collins (2004). It’s clear to me that relative humidity is not prescribed in climate models – both from the equations used and from the results that are produced in many papers. And people like the great Isaac Held, a veteran of climate modeling and atmospheric dynamics, also state the same. So, readers who believe otherwise – come forward with evidence. Still, that’s a different story from acknowledging that climate models attempt to calculate humidity from some kind of physics but believing that these climate models get it wrong. That is of course very possible. At least from this paper we can see that over this short time period, not subject to strong ENSO fluctuations or significant climate change, the satellite date shows upper tropospheric humidity increasing with surface temperature. And the CAM model produces similar results. I asked Andrew Gettelman why the model was run for a different time period than the observations and he said that the data (in the form needed for running CAM) was not available at that time. Measurements of outgoing longwave radiation (OLR) are essential for understanding many aspects of climate. Many people are confused about the factors that affect OLR. And its rich variability is often not appreciated. There have been a number of satellite projects since the late 1970’s, with the highlight (prior to 2001) being the five year period of ERBE. AIRS & CERES were launched on the NASA AQUA satellite in May 2002. These provide much better quality data, with much better accuracy and resolution. AIRS is an infrared spectrometer/radiometer that covers the 3.7–15.4 μm spectral range with 2378 spectral channels. It runs alongside two microwave instruments (better viewing through clouds): AMSU is a 15-channel microwave radiometer operating between 23 and 89 GHz; HSB is a four-channel microwave radiometer that makes measurements between 150 and 190 GHz. The simultaneous use of the data from the three instruments provides both new and improved measurements of cloud properties, atmospheric temperature and humidity, and land and ocean skin temperatures, with the accuracy, resolution, and coverage required by numerical weather prediction and climate models. 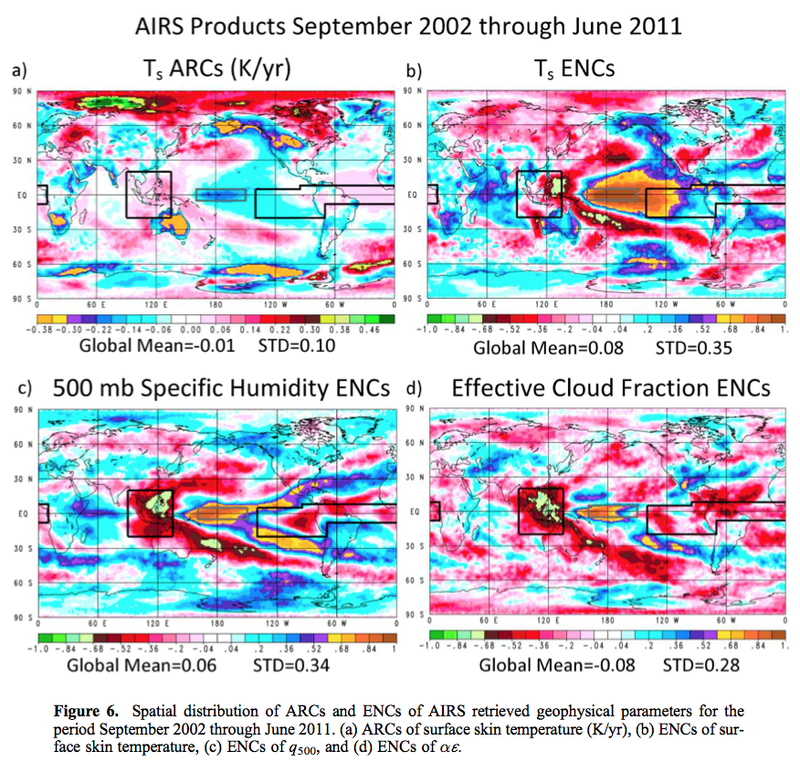 More about AIRS = Atmospheric Infrared Sounder, at Wikipedia, plus the AIRS website. More about CERES = Clouds and the Earth’s Radiant Energy System, at Wikipedia, plus the CERES website – where you can select and view or download your own data. How do CERES & AIRS compare? CERES and AIRS have different jobs. 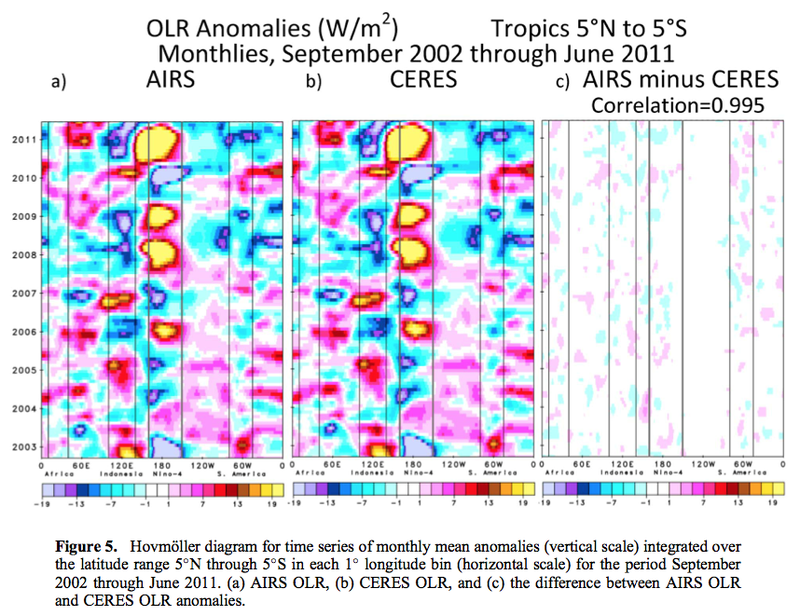 CERES directly measures OLR. 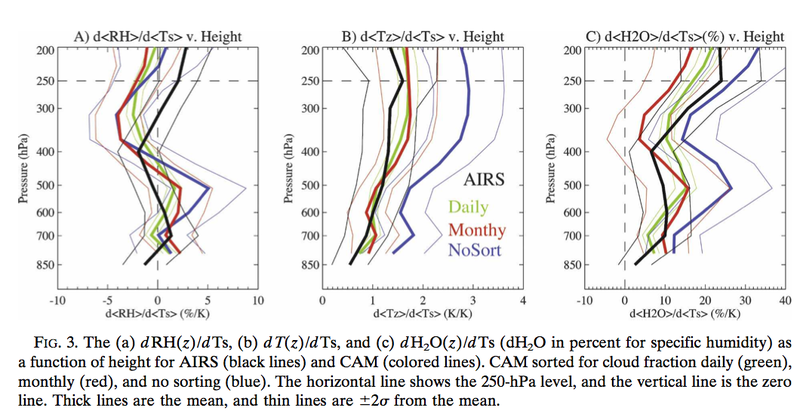 AIRS measures lots of spectral channels that don’t cover the complete range needed to just “add up” OLR. Instead, OLR can be calculated from AIRS data by deriving surface temperature, water vapour concentration vs height, CO2 concentration, etc and using a radiative transfer algorithm to determine OLR. The second thing to observe is that the measurements have a bias between the two datasets. But because we have two high accuracy measurement systems on the same satellite we do have a reasonable opportunity to identify the source of the bias (total OLR as shown in the graph is made of many components). If we only had one satellite, and then a new satellite took over with a small time overlap any biases would be much more difficult to identify. Of course, that doesn’t stop many people from trying but success would be much harder to judge. In this paper, as we might expect, the error sources between the two datasets get considerable discussion. One important point is that version 6 AIRS data (prototyped at the time the paper was written) is much closer to CERES. The second point, probably more interesting, is that once we look at anomaly data the results are very close. We’ll see a number of comparisons as we review what the paper shows. Behavior of OLR over this short time period should not be taken in any way as being indicative of what long-term trends might be. The ability to begin to draw potential conclusions as to whether there are long-term drifts with regard to the Earth’s OLR, beyond the effects of normal interannual variability, would require consistent calibrated global observations for a time period of at least 20 years, if not longer. 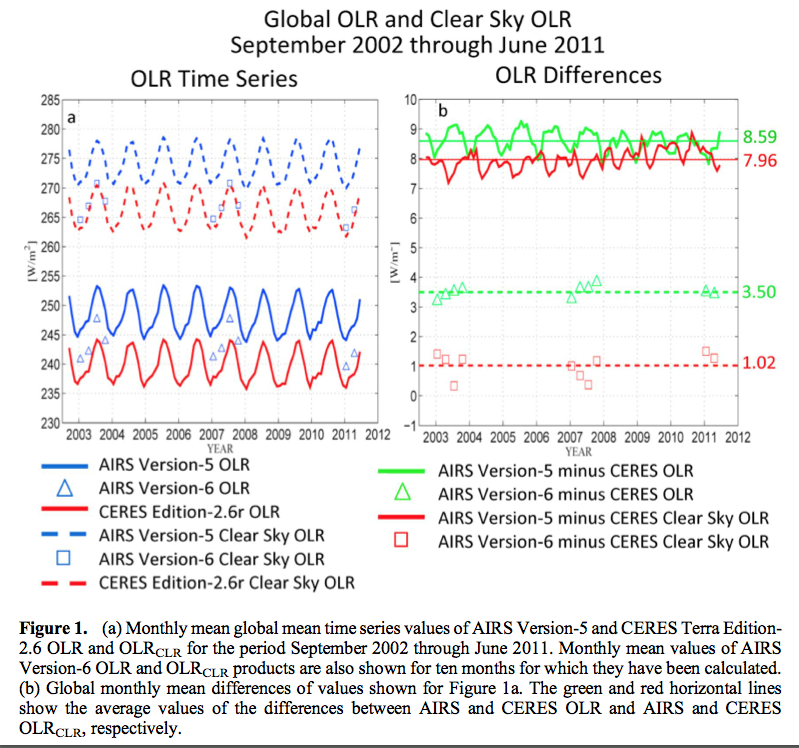 Nevertheless, a very close agreement of the 8-year, 10-month OLR anomaly time series derived using two different instruments in two very different manners is an encouraging result. 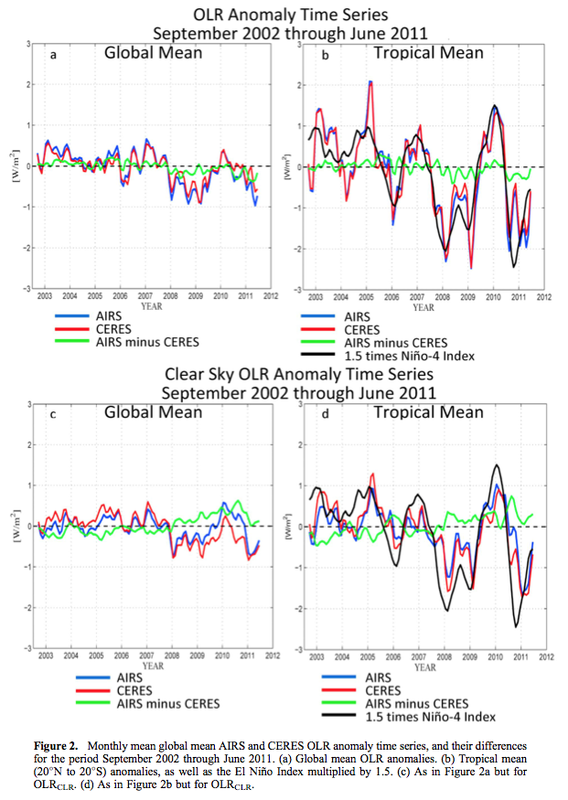 It demonstrates that one can have confidence in the 1° x 1° OLR anomaly time series as observed by each instrument over the same time period. The second objective of the paper is to explain why recent values of global mean, and especially tropical mean, OLR have been strongly correlated with El Niño/La Niña variability and why both have decreased over the time period under study. 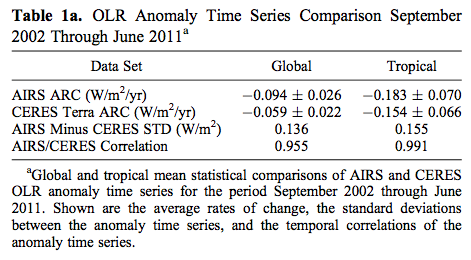 The authors define the average rate of change (ARC) of an anomaly time series as “the slope of the linear least squares fit of the anomaly time series”. We can see excellent correlation between the two datasets and we can see that OLR has, on average, decreased over this time period. Below is a comparison with the El Nino index. We define the term El Niño Index as the difference of the NOAA monthly mean oceanic Sea Surface Temperature (SST), averaged over the NOAA Niño-4 spatial area 5°N to 5°S latitude and 150°W westward to 160°E longitude, from an 8-year NOAA Niño-4 SST monthly mean climatology which we generated based on use of the same 8 years that we used in the generation of the OLR climatologies. We see that the tropics have the larger changes (also seen clearly in figure 2) but that some regions of the tropics have strong positive values and other regions have strong negative values. The grey square square centered on 180 longitude is the Nino-4 region. Values as large as +4 W/m²/decade are found in this region. And values as large as -3 W/m²/decade are found over Indonesia (WPMC region). The main parameters which affect changes in OLR month to month and year to year are a) surface temperatures b) humidity c) clouds. As temperature increases, OLR increases. As humidity and clouds increase, OLR decreases. So, focusing again on the Nino-4 region, we might expect to find that OLR has decreased because of the surface temperature decrease (lower emission of surface radiation) – or we might expect to find that the OLR has increased because the specific humidity and cloud fraction have decreased (thus allowing more surface and lower atmosphere radiation to make it through to TOA). These are mechanisms pulling in opposite directions. In fact we see that the reduced specific humidity and cloud fraction have outweighed the effect of the surface temperature decrease. So the physics should be clear (still considering the Nino-4 region) – if surface temperature has decreased and OLR has increased then the explanation is the reduction in “greenhouse” gases (in this case water vapor) and clouds, which contain water. We can see similar relationships through correlations. The term ENC in the graphs stands for El Nino Correlation. This is essentially the correlation of the time-series data with time-series temperature change in the Nino-4 region (more specifically the Nino-4 temperature less the global temperature). As the Nino-4 temperature declined over the period in question, a positive correlation means the value declined, while a negative correlation means the value increased. The first graph below is the geographical distribution of rate of change of surface temperature. Of course we see that the Nino-4 region has been declining in temperature (as already seen in figure 2). The second graph shows this as well, but also indicates that the regions west and east of the Nino-4 region have a stronger (negative) correlation than other areas of larger temperature change (like the arctic region). Both WPMC and EEPA regions together explain the reduction over 10 years in OLR. Without these two regions the change is indistinguishable from zero. It shows the amazing variability of climate – we can see adjacent regions in the tropics with completely opposite changes over 10 years. 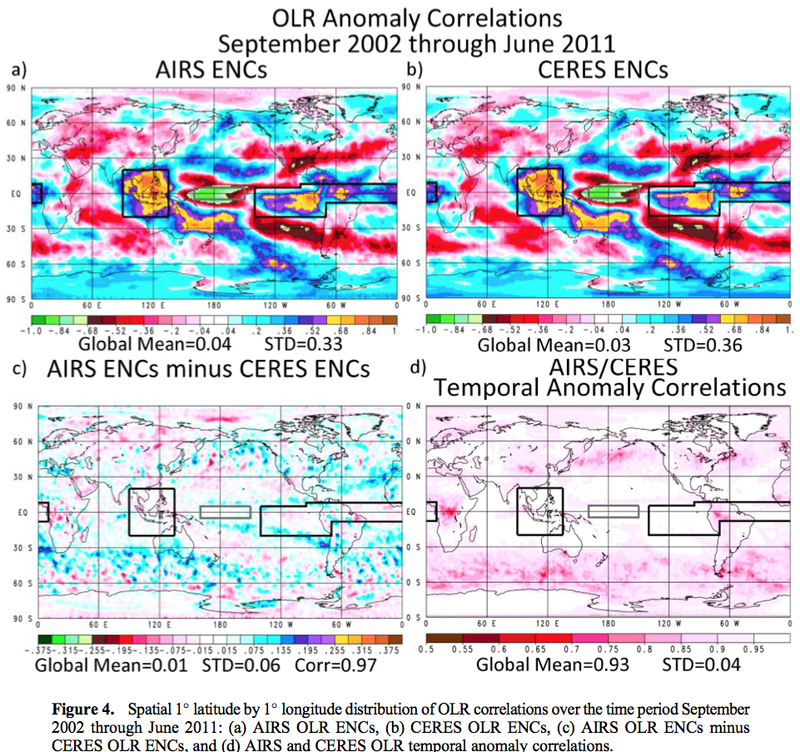 It shows that CERES gets almost identical anomaly results (changes in OLR) to AIRS. CERES directly measures OLR, while AIRS retrieves surface temperature, humidity profiles, cloud fractions and “greenhouse” gas concentrations and uses these to calculate OLR. 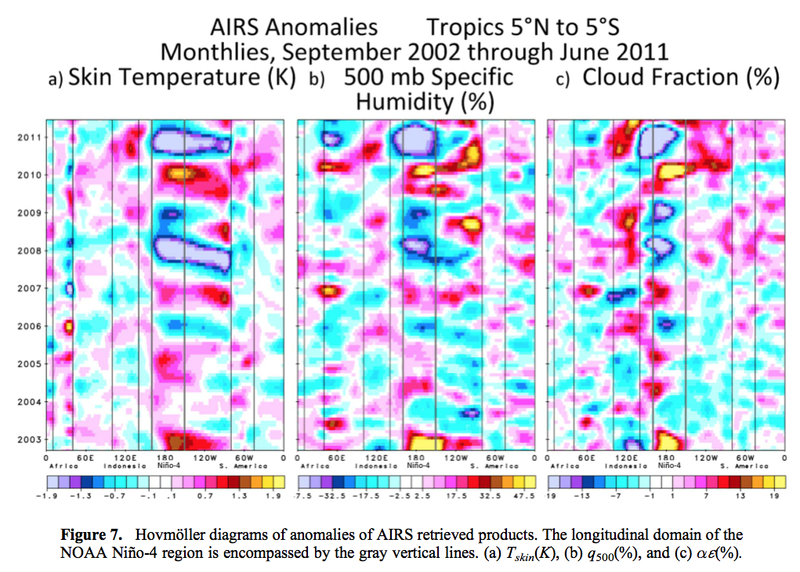 AIRS results demonstrate how surface temperature, humidity and cloud fraction affect OLR. OLR has – over the globe – decreased over 10 years. This is a result of the El-Nino phase – at the start of the measurement period we were coming out of a large El-Nino event, and at the end of the measurement period we were in a La Nina event. 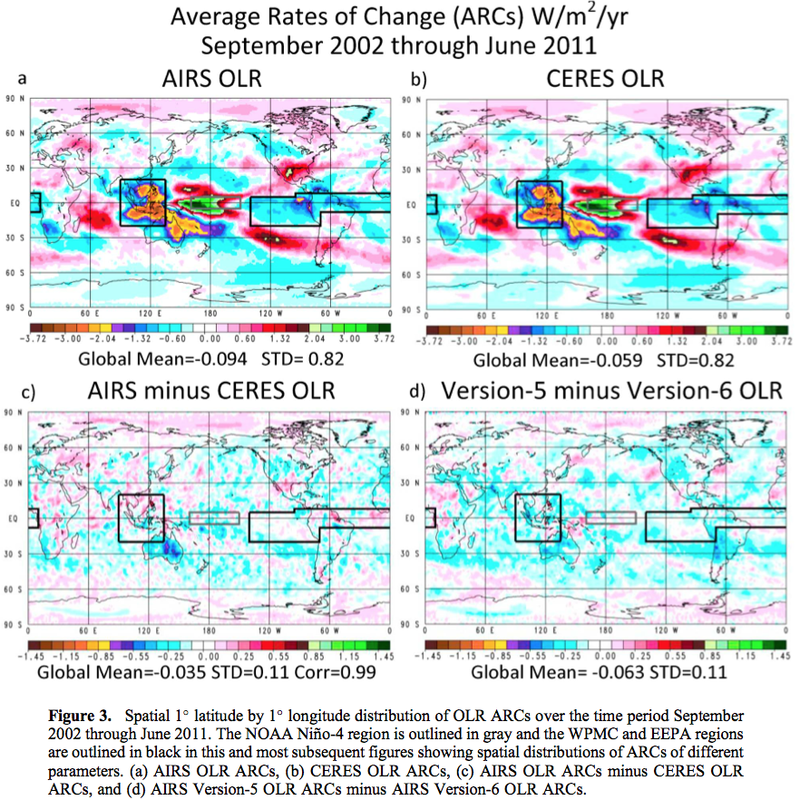 The reduction in OLR is explained by the change in the two regions identified, which are themselves strongly correlated to the Nino-4 region. The “atmospheric window” value is probably the value in KT97 which has the least attention paid to it in the paper, and the least by climate science. That’s because it isn’t actually used in any calculations of note. What is the Atmospheric Window? The “atmospheric window” itself is a term in common use in climate science. 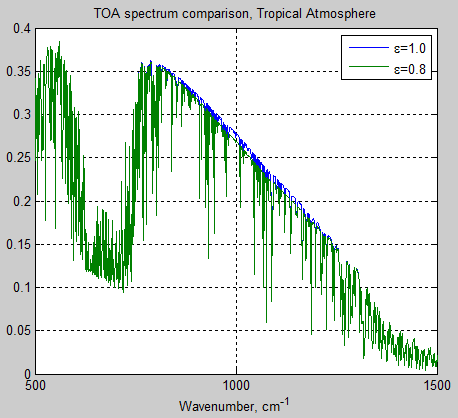 The atmosphere is quite opaque to longwave radiation (terrestrial radiation) but the region from 8-12 μm has relatively few absorption lines by “greenhouse” gases. 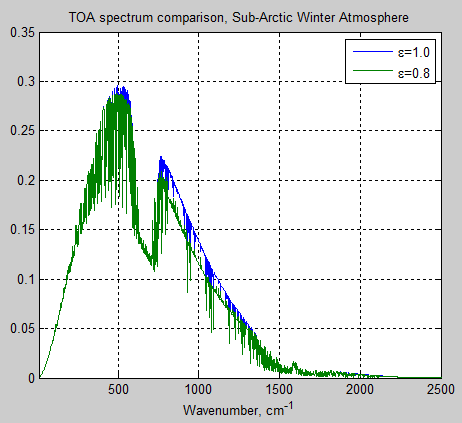 This means that much of the surface radiation emitted in this wavelength region makes it to the top of atmosphere (TOA). 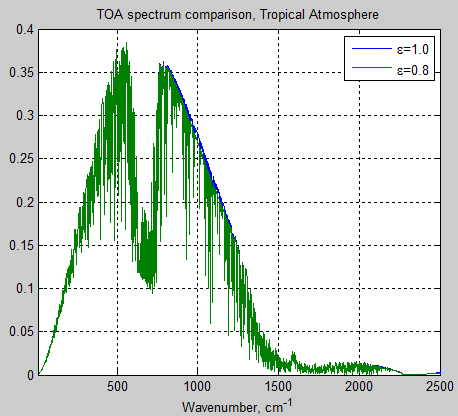 The term in KT97 was not clearly defined, but what we are really interested in is what value of surface emitted radiation is transmitted through to TOA – from any wavelength, regardless of whether it happens to be in the 8-12 μm region. One blog that I visited recently had many commenters whose expectation was that upward emitted radiation by the surface would be exactly equal to the downward emitted radiation by the atmosphere + the “atmospheric window” value. This can’t be the case for fairly elementary reasons – but let’s look at that later. 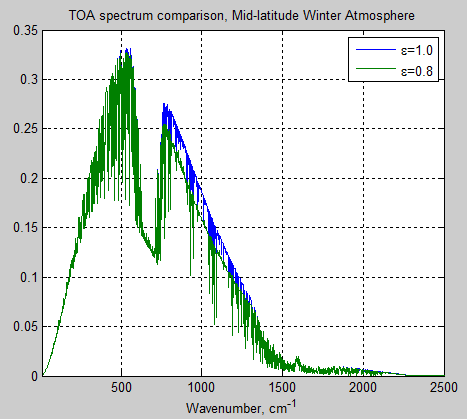 In Visualizing Atmospheric Radiation – Part Two I describe the basics of a MATLAB line by line calculation of radiative transfer in the atmosphere. And Part Five – The Code gives the specifics, including the code. These are all clear sky values, and the values in brackets are the values calculated without the continuum absorption to show its effect. Clear skies are, globally annually averaged, about 38% of the sky. These values are quite a bit lower than the values found in the new paper we discuss in this article, and at this stage I’m not sure why. This short article is intended to be a pedagogical discussion of one component of the KT97 figure [which was not updated in Trenberth et al. (2009)], which is the amount of longwave radiation labeled ‘‘atmospheric window.’’ KT97 estimate this component to be 40 W/m² compared to the total outgoing longwave radiation (OLR) of 235 W/m²; however, KT97 make clear that their estimate is ‘‘somewhat ad hoc’’ rather than the product of detailed calculations. The estimate was based on their calculation of the clear-sky OLR in the 8–12 μm wavelength region of 99 W/m² and an assumption that no such radiation can directly exit the atmosphere from the surface when clouds are present. Taking the observed global-mean cloudiness to be 62%, their value of 40 W/m² follows from rounding 99 x (1 – 0.62). Presumably the reason why KT97, and others, have not explicitly calculated this term is that the methods of vertical integration of the radiative transfer equation in most radiation codes compute the net effect of surface emission and absorption and emission by the atmosphere, rather than each component separately. 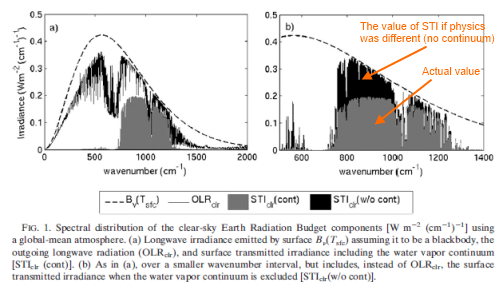 In the calculations presented here we explicitly calculate the upward irradiance at the top of the atmosphere due to surface emission: we will call this the surface transmitted irradiance (STI). In other words, the value in the KT97 paper is not needed for any radiative transfer calculations, but let’s try and work out a more accurate value anyway. Note that the dashed line is “imaginary physics”. The water vapor continuum exists but it is very interesting to see what effect it contributes. This is seen by calculating the effect as if it didn’t exist. We see that in the tropics STI is very low. This is because the effect of the continuum is dependent on the square of the water vapor concentration, which itself is strongly dependent on the temperature of the atmosphere. The continuum absorption is so strong in the tropics that STIclr in polar regions (which is only modestly influenced by the continuum) is typically 40% higher than the tropical values.Figure 3 shows the zonal and annual mean of the STIclr to emphasize the role of the continuum. 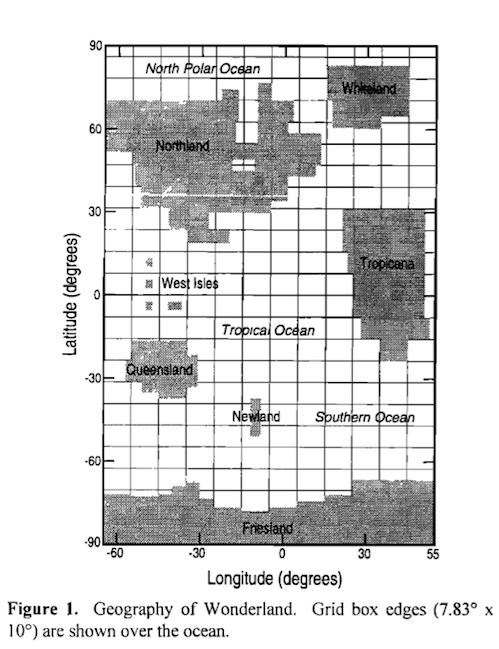 The STIclr neglecting the continuum (dash-dotted line) is generally more than 80 W/m² at all latitudes, with maxima in the northern subtropics (mostly associated with the Sahara desert), but with little latitudinal gradient throughout the tropics and subtropics; the tropical values are reduced by more than 50% when the continuum is included (dashed lines). The effect of the continuum clearly diminishes outside of the tropics and is responsible for only around a 10% reduction in STIclr at high latitudes. Interestingly, these more detailed calculations yield global-mean values of STIclr of 66 and 100 W/m², with and without the continuum, very close to the values (65 and 99 W/m²) computed using the single global-mean profile, in spite of the potential nonlinearities due to the vapor pressure–squared dependence of the self-continuum. For people unfamiliar with the issue of non-linearity – if we take an “average climate” and do some calculations on it, the result will usually be different from taking lots of location data, doing the calculations on each, and averaging the results of the calculations. Climate is non-linear. However, in this case, the calculated value of STIclr on an “average climate” does turn out to be similar to the average of STIclr when calculated from climate values in each part of the globe. Note that conventionally in climate science clear sky results are the climate without clouds (i.e., a subset), whereas ‘cloudy sky’ results are the results with both clear and cloudy (i.e., all values). Clear-sky STI (STIclr) is calculated by using the line by line model Reference Forward Model (RFM) version 4.22 (Dudhia 1997) in the wavenumber domain 10–3000 cm-1 (wavelengths 3.33–1000 mm) at a spectral resolution of 0.005 cm-1. The version of RFM used here incorporates the Clough–Kneizys–Davies (CKD) water vapor continuum model (version 2.4); although this has been superseded by the MT-CKD model, the changes in the midinfrared window (see, e.g., Firsov and Chesnokova 2010) are rather small and unlikely to change our estimate by more than 1 W/m²..
..Irradiances are calculated at a spatial resolution of 10° latitude and longitude using a climatology of annual mean profiles of pressure, water vapor, temperature, and cloudiness described in Christidis et al. (1997). Although slightly dated, the global-mean column water amount is within about 1% of more recent climatologies. Carbon dioxide, methane, and nitrous oxide are assumed to be well mixed with mixing ratios of 365, 1.72, and 0.312 ppmv, respectively. Other greenhouse gases are not considered since their radiative forcing is less than 0.4 W/m² (e.g., Solomon et al. 2007; Schmidt et al. 2010); we have performed an approximate estimate of the effect of 1 ppbv of chlorofluorocarbon 12 (CFC12) (to approximate the sum of all halocarbons in the atmosphere) on the STIclr and the effect is less than 1%. Likewise, aerosols are not considered. It is the larger mineral dust particles that are more likely to have an impact in this spectral region; estimates of the impact of aerosol on the OLR are typically around 0.5 W/m² (e.g., Schmidt et al. 2010). The impact on the STI will depend on, for example, the height of aerosol layers and the aerosol radiative properties and is likely a larger effect than the CFCs if they are mostly at lower altitudes; this is discussed further in section 4. The surface is assumed to have an emittance of unity. Our assumption that the surface emits as a blackbody could also be examined, using emerging datasets on the spectral variation of the surface emittance (which can deviate significantly from unity and be as low as 0.75 in the 1000–1200 cm-1 spectral region, in desert regions; e.g., Zhou et al. 2011; Vogel et al. 2011). Some decision would need to made, then, as to whether or not infrared radiation reflected by surfaces with emittances less than zero should be included in the STI term as this reflection partially compensates for the reduced emission. Although locally important, the effect of nonunity emittances on the global-mean STI is likely to be only a few percent. The point here is that if we consider the places with emissivity less than 1.0 should we calculate the value of flux reaching TOA without absorption from both surface emission AND surface reflection? Or just surface emission? If we include the reflected atmospheric radiation then the result is not so different. 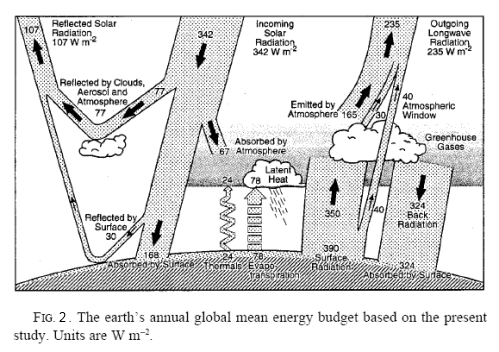 This is something I might try to demonstrate in the Visualizing Atmospheric Radiation series. As is standard in radiative transfer calculations, spherical geometry is taken into consideration via the diffusivity approximation, as outlined in this comment. This is quite easy to understand. I’ll invent some numbers which are nice round numbers to make it easier. Let’s say the surface radiates 400 and has an emissivity of 1.0 (implying Ts=289.8 K). The atmosphere has an overall transmissivity of 0.1 (10%). That means 360 is absorbed by the atmosphere and 40 is transmitted to TOA unimpeded. For the radiative balance required/desired by the earlier mentioned commenters the atmosphere must be emitting 360. Thus, under these fictional conditions, the surface is absorbing 360 from the atmosphere. The atmosphere is absorbing 360 from the surface. Some bloggers are happy. What is emissivity? It turns out, explained in Planck, Stefan-Boltzmann, Kirchhoff and LTE, that emissivity = absorptivity (for the same wavelength). Therefore, emissivity of the atmosphere, e = 90%. So, if the atmosphere is exactly the same temperature as the surface then they will exchange equal amounts of radiation. And if not, they won’t. Now the atmosphere is not at one temperature so it makes it a bit harder to work out what the right temperature is. And the full calculation comes from the radiative transfer equations, but the same conclusion is reached with lots of maths – unless the atmosphere is at the same temperature as the surface then they will not exchange equal amounts of radiation. This study presents what we believe to be the most detailed estimate of the surface contribution to the clear and cloudy-sky OLR. This contribution is called the surface transmitted irradiance (STI). The global- and annual- mean STI is found to be 22 W/m². The purpose of producing the value is mostly pedagogical and is stimulated by the value of 40 W/m² shown on the often-used summary figures produced by KT97 and Trenberth et al. (2009). As a result of this changed value, of course the standard energy balance diagram shown in KT97 and TFK09 needs some adjustments. Do Trenberth and Kiehl understand the First Law of Thermodynamics?